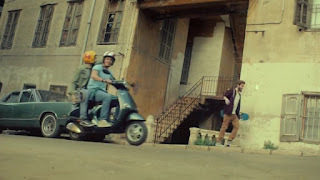 The new SGBL TVC for their youth account - ages 18-24 - visually speaks to them in the language they are used to: Retro hued Vespa-driving, blues-club attending, skateboard-riding, beach-bragging, and the list continues. Everything from the cars to the props to the mood to the colors gives this ad a late 70s flavor (very popular on Instagram) all dipped in nostalgia (again very popular with that age segment). What redeems the TVC majorly - is that all of this is a spoof of how banks speak to the youth. The Voice-Over makes it clear - "everyone wants to talk to the youth but no one understands us." "we don't all play guitar", "not all of us ride skateboards, you want me to go up the Akawwi hill? Are you nuts?" "we are not all graffiti artists" "nor is our second word bro" "sure we go out once in a while but we are the first to be at work the next day" "we don't all run after our dreams on the beach" "we are all youth but each one of us is different, so when you talk to us take that into account". Pity the visuals are not more in your face in that perspective, as watching the TVC without sound is a bit misleading. Still, major creative ground was broken as for once someone is speaking to real late teens, young adults without insulting their intelligence.